Your home is the single largest investment you will make for you and your family and just like all important investments you will need to ensure it is protected. When we take care of your home you can rest assured that we guarantee a safe, effective, and professional job that you can believe in. With years of experience, we will be able to proved you and your home with the best protection plan available. When it comes to pest control you shouldn't just want the best, you should get the best. Let Mahogany Flats prove to you why we are the best. We service the Greater Indianapolis area. 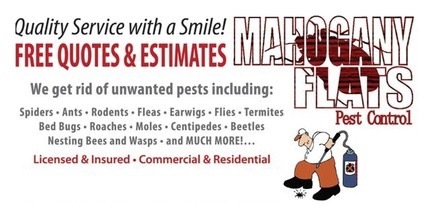 Mahogany Flats is a full service pest control company that uses the latest technology in the industry. Mahogany Flats is not the common "Spray and Leave" type of company. We take the time to investigate your issue to make sure that it is being resolved. Our staff is contantly researching the newsest pesticides and technologies as well as educating ourselves to guarantee our treatments work. Mahogany Flats is a family owned and operated business with over 15 years experience. Our purpose is to get rid of those pests invading your home and achieve complete customer satisfaction.